Moon rising over Minna Bluff. Yes, even with 24 hrs of sunlight, the moon still appears! A lot has happened over the past week! 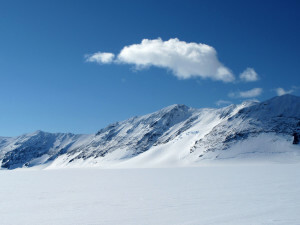 RAID is fortunate to be located in a fairly protected area rimmed by the Minna Bluff ridgeline, which seems to keep low clouds and ground fog – common in the McMurdo area – at bay. Last Friday the last three members of our RAID team flew out by helicopter to join the camp and drilling crews. 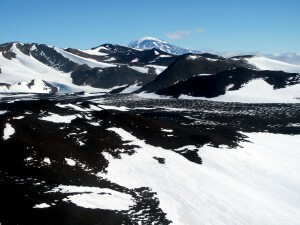 It’s a gorgeous flight over low volcanic rises and past the flanks of Mt Discovery, all draped in snow and ice. Our Minna Bluff camp is perfectly situated a few kilometers from the base of the bluffs, which form a rugged line of basalts to our north. The grounded ice here forms a small piedmont glacier, which on the surface is a smooth surface of sparkling snow. 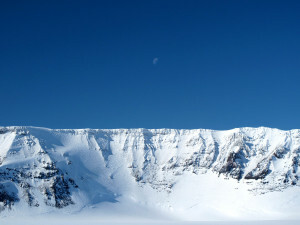 View across Black Island terrain toward Mt. Discovery from the helicopter flight to Minna Bluff. Lone cloud over Minna Bluff, a ridge of basaltic rocks ranging in age from 4-8 million years old. 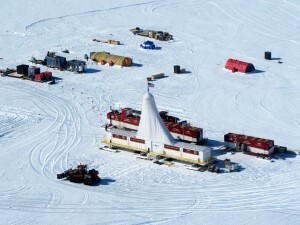 The camp is rustic by most measures, but exquisite by Antarctic standards! Our core group of 15 people includes six who operate and maintain the camp — everything from mechanicals, to cargo, snow maintenance, communications, galley operation, and much more. There are six drillers and three in the science group, myself included. We have a compact little town arranged on a pad of compacted snow probably an acre in size by now. There is a central Rac-Tent (think fabric-covered quonset huts with wooden floors) that we use as a galley, office and community space, smaller shelters, wooden modules for berthing and equipped with a shower, outhouses, and a ‘tent city’ made up of individual sleeping tents. 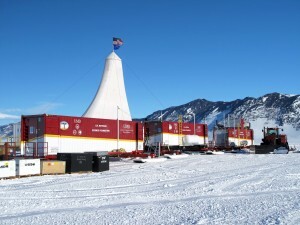 Outlying the camp is a cargo line, fuel cache, generator, and underground snow freezer. As anywhere else on the ice, making water is a constant activity. Here we have a couple of snow-melters that we feed with clean snow and pump into indoor water tanks. Remarkably, we have internet connection through a wifi repeater, although its pretty slow and intermittent, but everyone in camp is happy nonetheless. Aerial view of the newly established Minna Bluff camp from a helicopter. RAID sits in front of ‘town’, and the big Case quad-trac grooms the pad. A Rac-Tent serves as our community hall – galley, office, comm’s center, and general hangout. 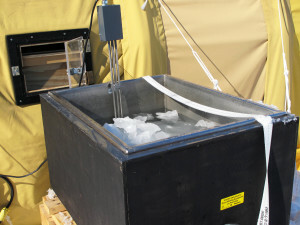 Snow melter – our source of fresh water. To set up camp involved several days of hard work by a team of four carpenters and the RAID camp staff. Meanwhile, Chris and Rich were busy getting the rig assembled, the mast and canopy up, and other components primed for operation. By the time the rest of us flew in, the camp was abuzz with activity. As soon as we built up to a full complement and the drilling rig was set up, we started with the first step of augering into the firn. We have to make a relatively large-diameter hole in the firn in order to reach non-permeable ice. In the transition from snow to firn to ice, the permeability reduces to the point that it is low enough for us to make a seal that will enable use of the drill with a circulating fluid. A ‘packer’ set against non-permeable ice will prevent the drilling fluid from leaking into the firn above. Getting down to the right level has turned out to be a lot more challenging than we imagined. In general, Minna Bluff has met all our expectations for snow and ice conditions, but we have no direct observations here about firn depth, so we are relying strongly on models that use temperature and snow accumulation rate as inputs. Unfortunately, the latter is very poorly constrained. Initially, the drillers made easy work of making a 7-inch borehole through the upper firn with the 50 m of auger we have on board. Thinking that the firn-ice transition might be a little deeper, they added some extra drill pipe to the auger flights in order to extend their reach and then augered ahead. This is where we encountered problems – without a continuous spiral of augers to the surface, the cuttings produced were simply piling up on top of the augers rather than being removed from the hole. We ran the augers for a long time at high RPM, trying in vain to get the ice chips out, but the chips eventually started to melt from the friction of all that mechanical energy being put into the hole. During a 20-minute tool change, those partially-melted chips refroze (the firn here is -23 ˚C and it has an almost unlimited ability to freeze things!). At this point the augers became firmly frozen into the hole; they were stuck in solid. The drill rig has plenty of ‘pulling’ power, but the pins that hold the drill stem to the augers soon sheared off, so the augers were not only frozen in but well out of reach, with about 95 feet of augers buried with their top located 24 feet below the surface. We managed to secure them to the rig with a daisy-chain of cargo straps so they couldn’t fall in any further, but we had no real lifting capacity. Over the next few days, we devised a series of improvised and hand-fabricated rescue tools to simultaneously loosen the frozen zone with local application of glycol and also pin the auger string to drill rods attached to the drilling rig itself. If we could make that critical attachment – 24 feet below the surface – then we stood a chance. The critical step in our rescue mission came from the ingenuity of Will, one of the drillers. He devised and built a mechanical device to lower into the hole and stick a pin into the coupling between the auger stem and drill above. We now refer to this device fondly as the “Magic Pin”. Invented out of available materials, Will’s idea was to arrange a sleeve at the bottom of an auger suspended from above by welding on a short section of split steel pipe (giving it a clothes-pin shape), into which he secured an auger pin, kept in a cocked position under pressure from a bungee cord, and held back by a small release pin connected by parachute cord to the surface. Resembling a cross-bow, it became a gun barrel loaded with a steel pin. Talk about Rube Goldberg! 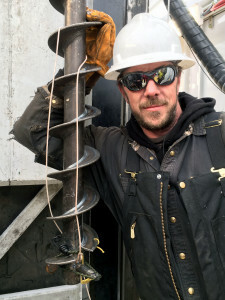 The idea was to lower the outfitted auger from the rig and fit its female end over the male end of the stuck section, then release the holding pin and snap the connecting pin into place to join the two sections. All of this had to be done in a very tight space to line up the hex shapes of the two mating sections, monitor their orientations on a video camera suspended down-hole, and line up the correct flat sections of the mating joints so that the holes on both connecting ends were aligned. We were all watching with eyes glued to the video feed at the driller’s control panel as the rescue auger was lowered in the hole, followed by the camera. Once everything was lined up, nothing to it but lower the upper auger over the stuck augers, and then – 1-2-3 – pull the small trigger pin to release the auger pin. SNAP! It went in the first time, and now we had a secure hold on the stuck string. With that we cheered and sighed relief – now we had full pulling power from the rig and also the ability to rotate. Whew!! It was only a short time later we were able to pull out. This is the Magic Pin designed by Will. 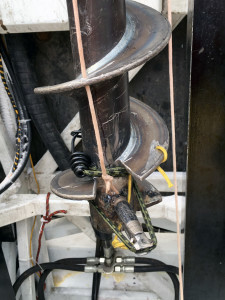 The cord on the left attaches to the trigger pin, and the head of the auger pin is pulled by the bungee. So after five days of problem-solving, fabricating various rescue tools, applying some antifreeze to un-stick the augers, waiting, fretting, and trying over and over, the augers finally came free and we were able to extract them. It has been a week of emotional highs and lows – from devising a fix, to thoughts of having to abandon this hole and losing the augers, to clipping on and working forward with the confidence of having the rig attached. We have learned a tremendous amount about the firn conditions, how our tooling works, and how we should revise our procedures. Through all of this, the RAID team of drillers and scientists have worked together extremely well under trying conditions and, despite the low points, managed to keep at it hour by agonizing hour. Never giving up, the ideas flowed from everyone on the team and were either set aside after discussion or set upon right away and put into action. Several innovative ideas were actually fabricated but never put into use. It was something to see everyone pulling together and many lessons learned. Will – proud designer of the Magic Pin. Now we are back into the firn-augering business and pressing ahead, albeit slowly, carefully, and incrementally. As we deepen the hole, we hope we will soon find an appropriate depth at which the packer will hold a seal against the borehole wall. Then, and only then, are we ready to start drilling in earnest. RAID setup in the field. 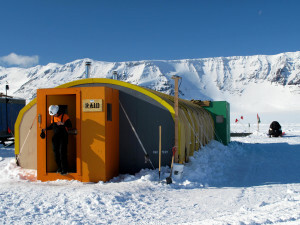 Antarctic field trials begin! 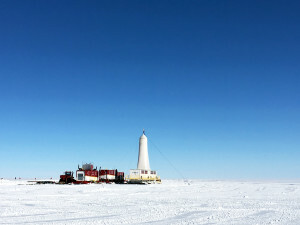 RAID rig with the Ross Ice Shelf behind.